This is a different group of Senufo from that treated under that title in this survey (that group is called Senari). One dialect in Côte d'Ivoire may be related. Senoufo, Mamara (Miniyanka, Minya, Mianka, Minianka, Mamara, Tupiire). Close to Supyire Senoufo, but intercomprehension is difficult. Senoufo, Shempire - 3 or 4 dialects. 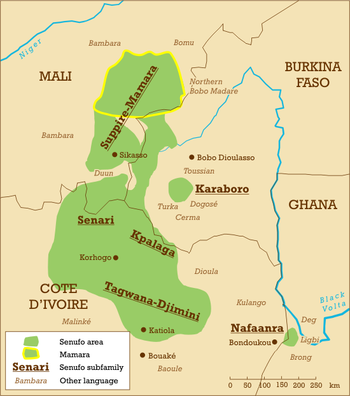 Relationship to Supyire Senoufo in Mali is undetermined. Kanha shazhɛɛyɛ ni xhùu pɔrigana. 2000. Mamaara (Miyɛngaa jomɔ pu) taanni taanni semi (Minankakan kalanni sɛben). 1999. Mamaara (miyɛngaa jomɔ pu) taanni taanni semi (Minankakan kalanni sɛben). 2000. Mamaara kalaa wu tayerege shuun wogo ki wo semi. 2001. Miyɛngáa kálaa nɔ-kɔɔnrɔ sémi (Minankakan kalan nɛbila sɛbɛn). 1996. Ponɔ na nɛ shɔgɔ fuŋɔ ni. 1999. Wù Mámaàra tì (Miyɛngáa jómɔ pú) taanni (Kʼa daminɛ Bamanankan na ka se Minankakan ma). 1998. Jofoo u a ja jo na yɛ?. 1998.
ɲwɔkanbwuunni: Supyire - tubabushɛɛnre, Tubabushɛɛnre - Supyire (Lexique de l'orthographe Supyire; Supyire - Français, Français - Supyire. 2003. It is a Latin-based orthography with extended characters and apparently diacritics to mark tone. Carlson, Robert. 1998. Wuu Supyire semɛ (Ecrivons le supyiré: Orthographe et grammaire pratiques du supyiré de Kampolondougou). Page from Hartell (1993) with Minyanka orthography, on the Rosetta Project site: http://www.rosettaproject.org/archive/myk/ortho-1 . Not aware of any localization efforts. Apparently there is separate literature for Supyire and Mamara/Minianka. Would some kinds of localisation nevertheless be best done in a way to cover the two? Should Nanerigé and Sìcìté (both of Burkina Faso) be added to this profile? There is also a larger question how to treat the Senufo dialects not part of either the Senari or the Suppire groups.